My craft room got a new addition this week and I’m so excited to share it with you. Are you ready for it? 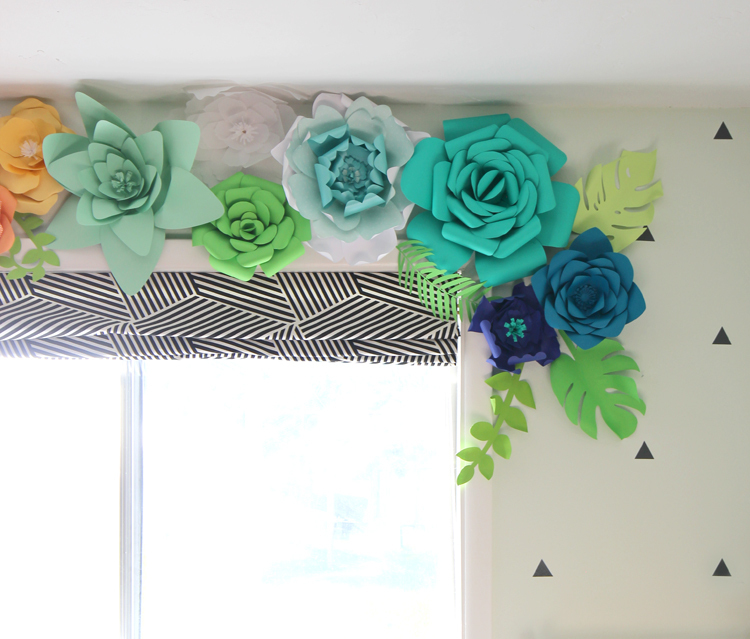 I covered the wall around my window with giant paper flowers! It’s a colorful rainbow of floral goodness. 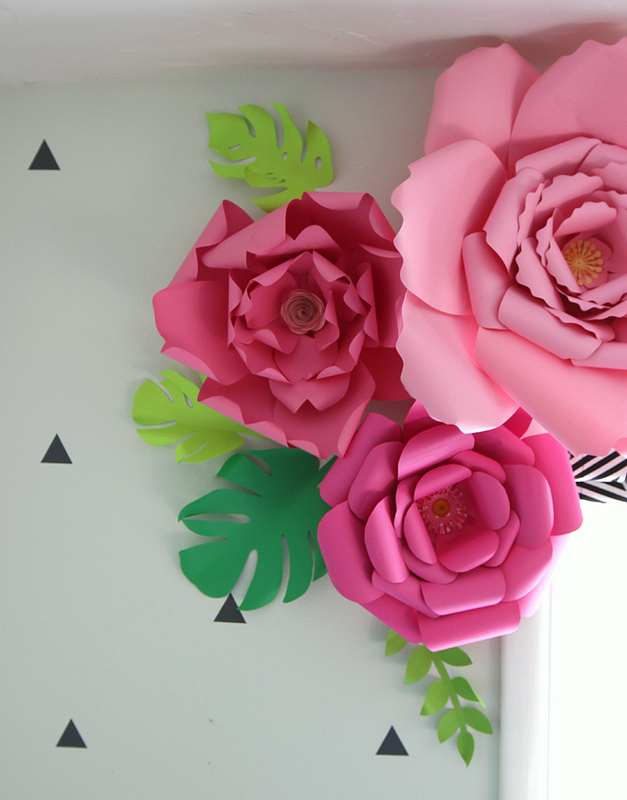 And today I’m sharing the flower templates and a tutorial for how you can make your own big, bold and beautiful paper flowers. 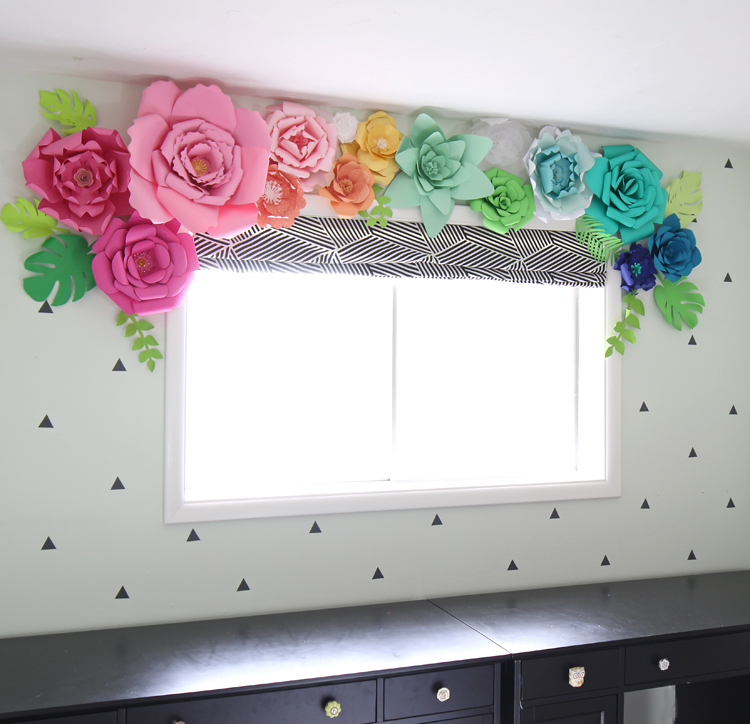 I can’t even tell you the pizzazz that these paper flowers add to my craft room and how much I’m in love. 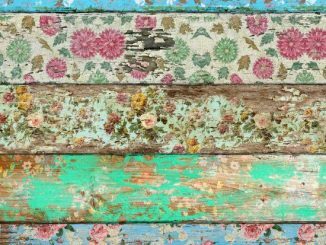 It is such a huge focal point in the room and I adore the bright colors and whimsical feel. My craft room is my happy place and these giant, colorful flowers really reflect that feeling. 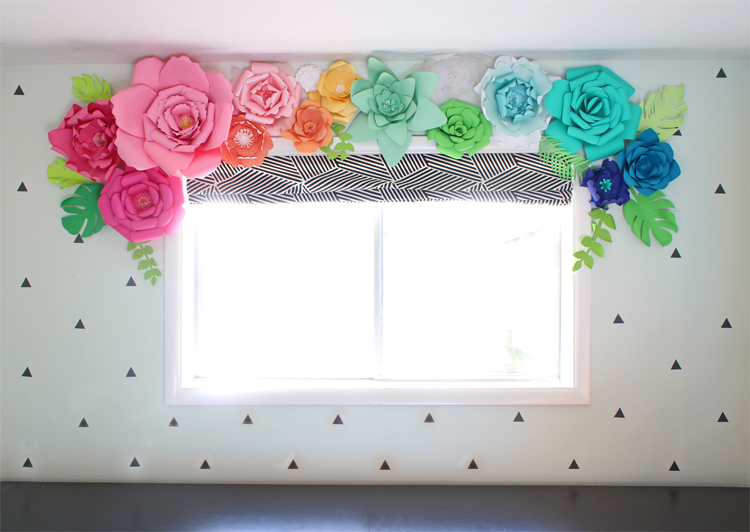 Paper flowers would also be adorable in a little girls bedroom and there are endless options for color combinations to match your decor style. And the best part is that the whole thing is made from nothing but paper and hot glue! , so be sure you buy enough cardstock. Nothing’s worse than being one sheet of paper short and having to run back to the store in the middle of a project. I went when open stock paper and paper packs were all 50% off, so I feel like I scored big time. Making paper flowers is simple and so fun. All you need is paper, scissors and hot glue. You can use a Silhouette machine if you have one, but cutting by hand is totally doable too. I created a video tutorial to show you exactly how to make them. Download the paper flower templates below and import them into Silhouette Design Studio. Trace around the shapes and resize the flower petals to fit on the paper you’ll be using. Adjust cut settings for cardstock and send petals to be cut. Curl the edges of the flower petals around a pencil. Fold the slit on top of itself and glue it into place. Glue the smallest center petals onto a cardstock circle, then repeat for the medium sized petals and repeat again for the largest petals. Layer the three rounds of petals together and glue in place. Add a center decoration if desired. Download the printable paper flower template below. Resize the petals on the computer if desired. Print. Cut out the flower petal templates. Trace onto cardstock and cut out with scissors. To speed up the process, you can cut through several layers of cardstock at a time. For this particular display of paper flowers, I wanted a mix of big and small flowers with tropical greenery peeking out a bit, so I planned out which colors in rainbow order would be big and small, then mixed different flower shapes so there was plenty of variety. It’s hard to tell in the pictures, but I found some really pretty pearlized paper at Hobby Lobby and used that for the lightest pink flower and the ombre aqua flower. It adds a subtle sparkle that I really love. I also bought a pack of vellum and created one entire flower from it. It basically disappears in pictures but is pretty in real life. I created free printable flower templates for you to enjoy. Once you enter your email, you’ll have access to several PNG flower templates that are ready for a Silhouette or Cricut machine and some PDF files that can be printed on your home computer and cut out by hand. I also purchased THESE cut files by Carina Gardner from the Silhouette Design Store. It’s what I used for the flower centers. I just added the slits to the bottom of each flower petal to make them more 3D. This was such a fun project. Each paper flower is a miniature work of art and watching the rainbow of flowers come together was really satisfying. It will inspire me every day as I’m in my craft room making. I mean, how could you not be inspired when you look up and see this?! 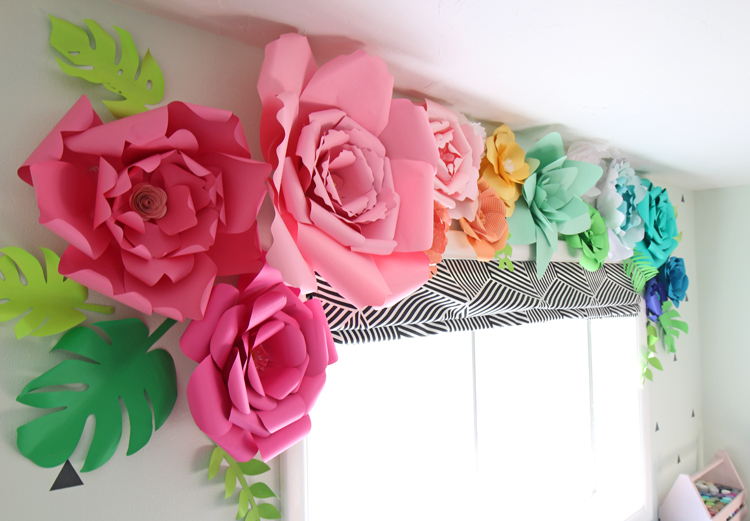 How do you attach the paper flowers to the wall? I used thumb tacks hidden under a layer of petals. 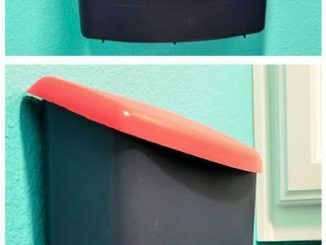 If you don’t want to put holes in the walls, the velcro-like Command strips would work well. I don’t recommend using tape unless the paper flowers will only be used as a short-term decoration. Tape tends to fall off with time. Cardstock. I bought it in packs at Hobby Lobby because it was cheaper per page. You can use regular weight paper, but the flowers tend to be a little bit droopy. There is a teal colored box above that says, “Get The Printable Files.” Enter your email address in the box and the files will be emailed to you. Your cut files are for Silhouette. 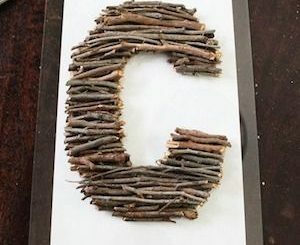 How can I make this project on Cricut? Download the printable templates (not the Silhouette files) and use the trace feature in Design Space to trace the shapes. What size do I cut out the petals? Any size you want! You can adjust the sizes of any of the templates in Silhouette Studio or if you’re cutting the petals by hand, adjust the pattern on the computer before printing. You can adjust the size in software such as Paint, Photoshop, Illustrator, or PicMonkey. As a reference, the largest flower in the photos is sized to one petal per 8.5×11″ sheet of paper for the largest outside round. Where did you get the leaf pattern? I purchased a cut file from Silhouette Design Store. They had a ton to choose from! If you are cutting leaves by hand, Google “jungle leaves” and print one out to use as a pattern. I can’t open the free files. What’s wrong? The number one reason people can’t access the files is that they are at work and their work server blocks access to Google Drive. This is especially true for school districts. Try opening the files again at home and see if that helps. Aren’t these flowers a huge dust collector? Not really. And when I notice they’re dusty, I spray them down with canned air (or blow air out of my shop vac), then vacuum the floor. Easy peasy!